The Stevie® Awards is pleased to show you the first photo of the real Silver and Bronze Stevie Awards trophies which have been introduced as part of our 10th anniversary celebration of the start of the Stevie Awards movement. The new awards are manufactured by R.S. Owens in Chicago, the longtime manufacturer of the Stevie and other major awards including the Oscars and the Emmys. The Silver and Bronze Stevie Awards will be introduced at the 6th annual Stevie Awards for Sales & Customer Service, which recognize the achievements of call center, customer service, and sales professionals worldwide, on February 27 at Caesar's Palace in Las Vegas. The business awards banquet, which will confer sales awards and customer service awards, will be the first Stevie Awards program in which Silver and Bronze winners will be named. (Tickets are still available; support your organization's good customer service and sales excellence by reserving a table today.) Henceforth, all honorees in Stevie Awards programs will be Gold, Silver, or Bronze Stevie Award winners. Finalists that receive the top scoring qualifying entry in each category will receive a Gold Stevie Award. Finalists that receive a final average score of at least 8.0 out of a possible 10 will be named Silver Stevie Award winners. All other Finalists will be designated as Bronze Stevie Award winners. Gold Stevie winners will automatically receive a Gold Stevie trophy. Silver and Bronze Stevie winners will automatically receive a Silver or Bronze medal and will have the option to purchase their Stevie trophy. With the introduction of our new corporate awards distinctions, there will no longer be Finalist certificates. 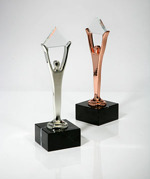 Leave us a comment and let us know what you think about the new Silver and Bronze Stevie Award trophies!